As human beings we are adept at seeing patterns. 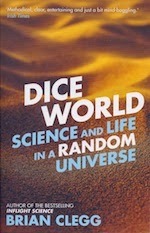 It’s how we Dice World makes plain, reality is all too often driven by randomness, without a pattern in sight. At an entertaining canter, Brian Clegg takes us through the way superstition turns correlation into causality; why economists are so bad at predicting real human responses; and how the power of statistics can reveal hidden truths that, if it weren’t for the logical walkthroughs, you just wouldn’t believe. The book starts by showing us how the world seemed an ordered place – briefly in-line with Newton’s clockwork universe – and then how the cracks began to show when it proved impossible to accurately predict the movement of just three bodies in space. Chaos and randomness intertwine – chaos technically predictable but practically impossible to do so, while true randomness, the behaviour at the heart of quantum theory is totally unpredictable but often fits neat distributions. You’ll meet the smartest person in the world – and strange creatures like Schrödinger’s cat and Maxwell’s demon; see why a window at night is a fiendishly complex quantum device with randomness and probability at its heart; and find out what’s going on with entropy, the end of the universe and free will. Oh and discover how to get the best prediction of whether or not someone owns a golden retriever. you’ve got your best chance of understanding just what’s going on in the universe; and to have some laughs along the way. Not to mention discover how to win a sports car rather than a goat. Which can’t be bad.